One of the things I knowingly sacrificed when we moved to Colorado was easy access to fresh seafood. Sure there is some good seafood here if you catch it yourself (trout, etc. ), but it’s not like there’s a huge seafood market where I can just take my pick. Luckily, I befriended a shop owner around here though that flies in fresh seafood occasionally. It’s definitely pricey, but you can tell that it’s super-fresh and sometimes it’s worth the price. A few weeks ago she called me about some really fresh wild caught salmon that they got in. After seeing it (and smelling it), I couldn’t pass it up. I wanted to do something pretty light with it and so I came up with a really simple citrus glaze that totally rocked. It ended up being one of the healthier meals I’ve made recently. And totally delicious. 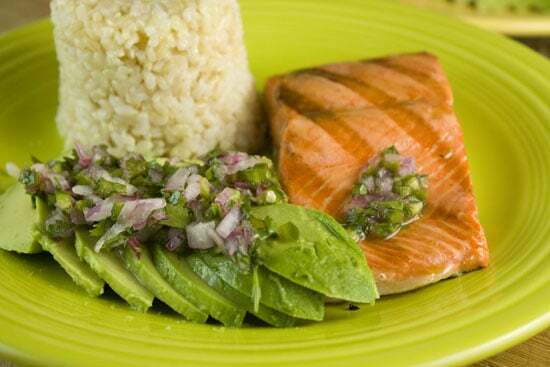 Beautiful fresh salmon grilled with a zesty citrus glaze. Served with an avocado salad. 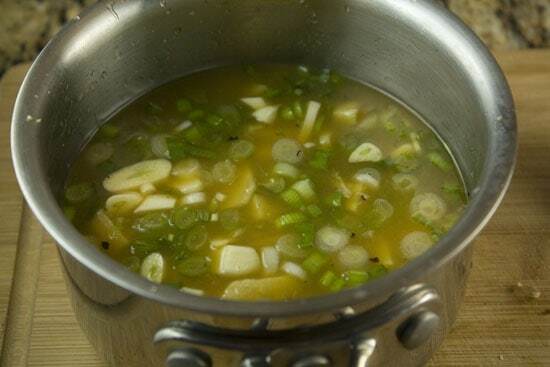 1) For the glaze, add ingredients to a small pot and bring to a simmer over medium heat. 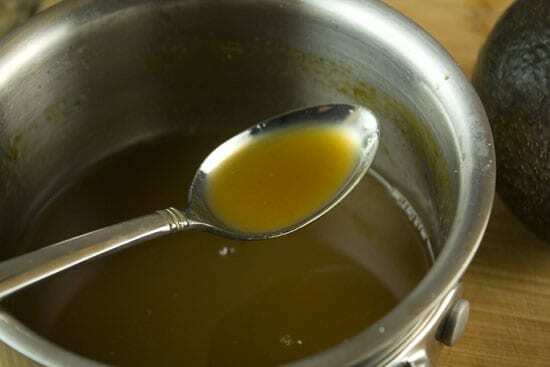 Stir continuously until sugar is dissolved. 2) Simmer on low for 20-30 minutes until glaze is reduced to 1/3. Strain sauce. It should be a light syrupy consistency. 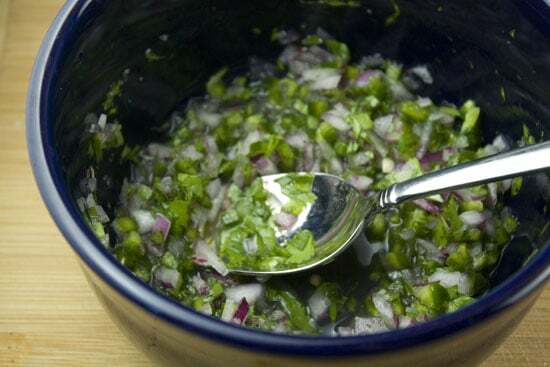 3) For salad, finely dice all ingredients except avocados and mix with lime juice. Set aside. 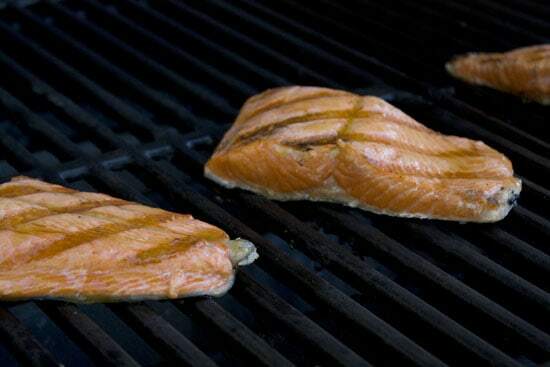 4) Grill salmon, skin side up, over high heat, for about 3-4 minutes. Flip. 5) Once flipped, start brushing on glaze. Continue to brush on glaze until salmon is finished – about another 3 minutes. 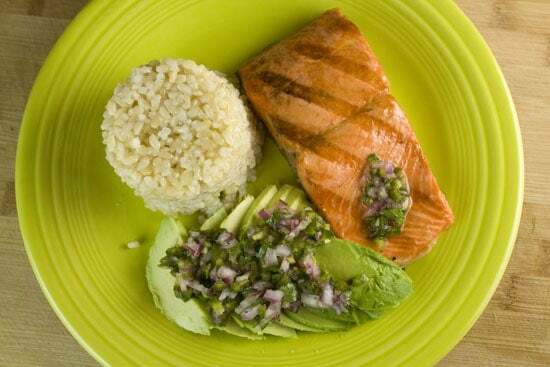 6) Serve salmon with rice and avocado salad. With really good seafood, you don’t want to overpower it with anything too heavy. This glaze is nice and light but the flavor is really fresh. It’s perfect for summer. Add all the ingredients to a small pot and get this simmering over medium heat. You don’t need to worry about dicing up the ingredients really small. Just toss everything into the pot and strain out the big stuff at the end. 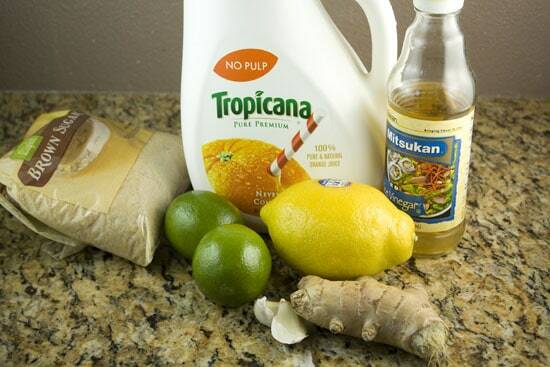 Make sure to stir this regularly so the sugar doesn’t burn on the bottom. Eventually it will dissolve though. You’ll want to simmer this for about 20 minutes probably so it reduces to about 1/3 of it’s original volume. Then you can strain out the ginger/scallions/garlic and you’ll be left with a really flavorful but light syrup which you can glaze the salmon with. It looks kind of brownish, but trust me, it smells really fresh and citrusy. You’ll love it. I decided to serve the salmon with a light avocado salad and some rice. The avocado salad was basically just my standard guacamole recipe, deconstructed. So I mixed up some red onions, cilantro, jalapeno, and lime juice and used that as a topping for fresh avocados. The fish that I had was awesome. I almost wanted to just eat it raw it was so fresh. The color was out of this world. I haven’t had salmon this good in a while. I cut the salmon up into three pieces (about 5-6 ounces each), and grilled them. 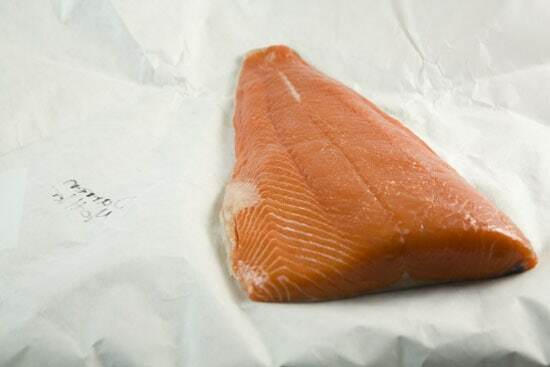 The key with cooking salmon this fresh is to not overcook it, whatever you do. I cooked mine for about 3-4 minutes per side on a really hot grill. Start the fish skin-side up. Then once you turn it, start adding your glaze on the top of the salmon. Keep brushing the fish with the glaze every minute or so until it’s done cooking. It should develop a nice light coat of the citrus glaze on top as it cooks. About 6-8 minutes of total cooking time is all you need for these. In the wider sections of my fillets they were a bit medium rare in the center but that didn’t bother me at all. In fact, I liked them to be a bit raw. The only other thing I served these with was some good brown rice. If you want to get fancy, after your rice is cooked, add about a teaspoon of melted butter to a coffee cup and swirl it around. Then pack in some rice into the coffee cup. 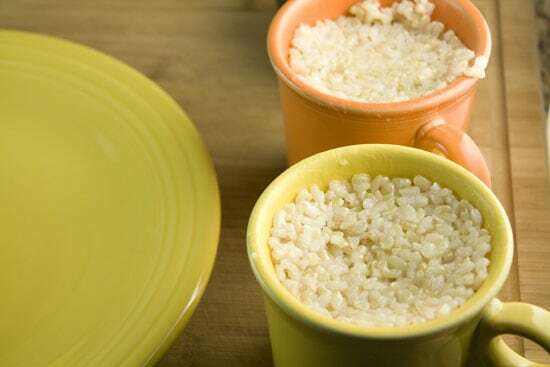 When you flip these over on the plate you’ll have these perfect little towers of buttered rice. This was my final plate with the salmon, avocado salad, and rice. The glaze was really light on the fish. You can barely see a shimmer on it. Nothing too heavy. You could definitely taste it though. It was a bit sweet and had a great citrus flavor that goes really well with fish. If you don’t have a grill, you could pan sear your salmon for the same result. Again though – just don’t overcook the fish! If you’re lucky enough to have access to fresh salmon, give this a shot! Look at you getting all fancy with that rice presentation. I love it. I know right?! I could charge $4 for that side of rice in a restaurant! Hi Nick. I just found your site while crusing around the Internet looking for a crock pot yogurt recipe. Thanks! Anyway, made the citrus salmon tonight and it was amazing. Love it. Can’t wait to share it with my father-in-law, who is a total fish guru. I’m really enjoying the your site. It’s down to earth, funny and the recipes look great. Cheers! Hi Nick! Thanks for the inspiration. I just made salmon tonight, with the citrus, but next time I am going to duplicate your entire meal. Hope your knee heals quickly. My husband had double knee replacement two years ago, so he feels your pain, literally.